Video screenshot of former Bosasa head Angelo Agrizzi (file photo). "Mr Peet Venter and Mr Angelo Agrizzi will testify this week and then on Friday there will be further witnesses, depending on the length of time that is allocated to each of those witnesses - the witnesses due on Friday may have to come on Monday," he told inquiry chairperson Deputy Chief Justice Raymond Zondo. 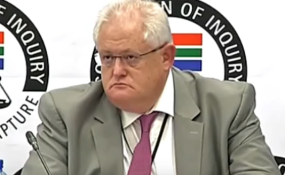 In his marathon nine-day testimony in January, Agrizzi revealed extensive allegations of corruption involving several government ministers - including Nomvula Mokonyane and Gwede Mantashe - as well as ANC MPs, journalists, union officials, and how Bosasa (now African Global Operations) colluded with senior officials over more than a decade to cook tender documents and score lucrative contracts with the state.